Hi All – Thanks to the wonderful new Blocs Store, we now have some fun things to play with! However, I’m not finding guidance anywhere on how to deploy the new Snap to Scroll bric. So far, I’ve installed the bric via Extension Manager, but I’m not finding how to place or use the bric on a page. I see it added in the Extension Manager, but don’t find it anywhere else. Just add it as a normal bric to a page. So click a + on the design canvas inside a column and search snap scroll. I am wondering if we can change the color / size of the dots and / or the text color? Perhaps with Custom Classes? You can yes, try preview then right click and inspect. 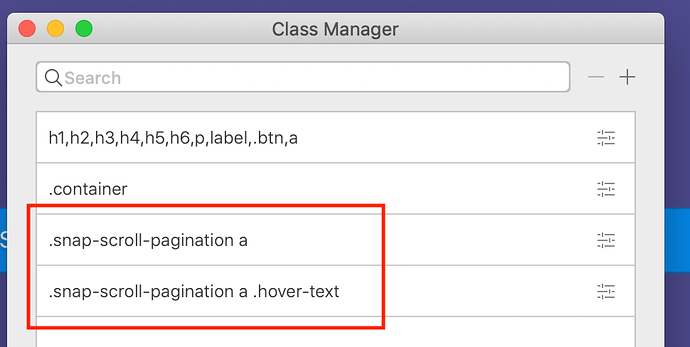 You can then get the classes used for them, or export and look in the style.css for the snap scroll pagination classes. Thanks…I’ll give both options a try…but just so I understand, the second option sounds like I would need to open the exported files and edit the CSS is VS CODE or ATOM or perhaps Pinegrow, or another editor? Is that correct? Or, is this method simply forensics to see what classes control the dot size and text color, and then once I see that, I make the changes to those classes within Blocs Class Manager / Class Editor?? Forensics. I just don’t remember the names off the top of my head. @DanielF here are the 2 classes which you need to add and then modify the text color. Awesome…so kind of you! I’m sure other’s will also benefit from this post.